Price fact: The price is 6.43 £ higher than the average over the last 10 weeks. Price fact: The price is 1.13 £ higher than last week. Price fact: The price is the highest in 7 weeks. 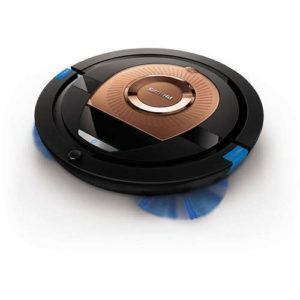 The Philips FC8776 is a smart and compact robot vacuum with a low noise level and long operating time per charge. This model includes the famous Philips smart detection system, which allows the robot to optimise its cleaning strategy as it reaches every corner of your home. The Philips FC8776 also comes with a new TriActive XL nozzle, with its extra large width allowing for faster and more efficient cleaning than ever before. This model has a powerful lithium-ion battery with 120 minutes of operating time per charge. Along with a longer cleaning cycle, the Philips FC8776 battery also has a longer lifetime and shorter charging time than most of its competition. This robot vacuum will take about 4 hours to charge when the battery is empty, with this duration increasing over time as the battery gets older. The Philips FC8776 returns home to its own charging station when the battery gets low. The Philips FC8776 features the Philips smart detection system for efficient navigation. With a wealth of sensors on-board, this vacuum cleaner has the ability to detect and understand the surrounding environment of your home. A number of cleaning strategies can be applied depending on the surrounding space, with six infrared sensors used to detect furniture, stairs, and anything else that’s likely to get in the way. While it lacks the advanced connectivity and scheduling of more expensive models, the Philips FC8776 can be controlled via remote control and scheduled up to 24 hours in advance. This automated vacuum cleaner features a 4-wheel system to traverse over bumps, two extra long brushes for corners and edges, and four distinct cleaning styles for different rooms. The Philips FC8776 has a very low noise level at just 58 dB, a dust capacity of 0.3 L, and a weight of just 1.73 kg. This model has a low profile at only 6 cm and comes in black and bright copper.